Entire process for admission to degree courses in Telangana will be online from the ensuing academic year. The decision was taken by the Telangana State Council of Higher Education on degree online services Telangana (DOST). The entire process will be online till the final phase. The students need not visit respective colleges for confirmation. The students shall confirm online and visit the college on the first day of instruction. This year, the registration time will be reduced and results data of Central Board of Secondary Education and other boards will be captured directly from the respective boards. The students will pay the college fee online at the time of online admission process. Detailed process of online admissions will be declared on the day when th;e intermediate board results will be announced. DOST make the online process more student friendly and address all the problems which the students are facing while taking admissions. 1. 2019 DOST will be very simple, students’ friendly, straightforward and completely online. 2. Time for registration process will be reduced. 3. The entire process will be online till the final phase. The students need not visit respective colleges for confirmation. The students shall confirm online and visit the college on the 1st day of instruction. 4. Results data of CBSE and Other Boards will be captured directly from the respective Boards. They would directly linked through Web/ Technical Board server once the results are declared. 6. OTP will be in the alphanumeric to differentiate OTP with the one which is in the numeric form. 7. All the HLCs shall be ready with the new Aadhaar biometric devices with RD. 8. All the process of Online Admissions, DOST will be modified and announced on the day when the Bord of Intermediate would announce the results. 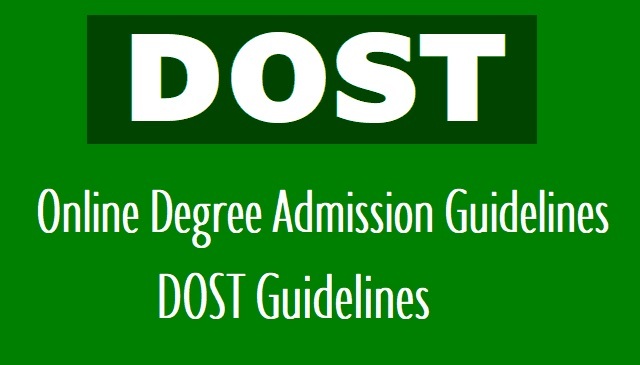 Guidelines for DOST Online Degree Admissions: GOVERNMENT OF TELANGANA: Higher Education – DOST Guidelines for admission of the students into Undergraduate Courses in Arts, Science, Social Sciences, Commerce, Management, Computer Applications and Social work etc. including Honours, in all the faculties in University Constituent Colleges, University Autonomous Colleges, Government Colleges, Government Autonomous Colleges, Private Aided Colleges, Private Unaided Colleges, Private-Autonomous Colleges (Aided and Unaided) – Issued. 1. G.O. Rt.No.67, Higher Education (CE) Dept., dt.10-04-2017. 2. G.O. Rt.No.38, Higher Education (CE) Dept., dt.09.02.2018. 3. From the Commissioner of Collegiate Education, T.S., Hyderabad, Letter No.01/DOST/2018/Acad.Cell/CCETS, dt.17-04-2018. ORDER: In the G.O.2nd read above, Government have accorded permission to the Commissioner of Collegiate Education, Telangana State, Hyderabad, to initiate the process to conduct Undergraduate (UG) online admissions for the ensuing Academic Year, 2018-19 through Degree Online Services of Telangana (DOST), based on the same system/provisions mentioned in the reference 1st read above. Accordingly, a Meeting of the Project Monitoring Unit (PMU) was conducted on 19.03.2018, which was also attended by the Chairman, Telangana State Council of Higher Education, Hyderabad and the Guidelines to be adopted for conducting DOST for the Academic Year, 2018-19 were discussed in detail. Further, Follow up-Meetings were also conducted by the Commissioner of Collegiate Education, Telangana State, Hyderabad and Vice-Chairman, Telangana State Council of Higher Education, Hyderabad in the matter. Accordingly, in the reference 3rd read above, Draft Guidelines have been furnished by the Commissioner of Collegiate Education, Telangana State, Hyderabad to the Government. 2. After careful examination, the Government hereby accept the Guidelines furnished in the reference 3rd read above, which are appended to this G.O as Appendix including Annexures I & II. The Vice-Chancellors of the six Conventional Universities i.e., Osmania University, Kakatiya University, Mahatma Gandhi University, Satavahana University, Telangana University and Palamuru University are requested to place these Guidelines in their Executive Councils for approval so as to adopt them for the UG admissions of the University for the Academic Year, 2018-19 through DOST online portal. 3. The Commissioner of Collegiate Education, Telangana State, Hyderabad, Vice-Chancellors of the six Universities and Vice Chairman, Telangana State Council of Higher Education shall take necessary action in the matter accordingly. In this Govt Order, detailsed Guidelines have been issued for DOST. Appendix to G.O.Ms.No.12, Higher Education (CE) Department, dt.20-04-2018.